ASUR measures emission lines at submillimeter wavelengths of trace gases in the atmosphere, which are thermally excited. Due to its frequency range between 604.3 and 662.3 GHz (respectively a wavelength of 0.5 mm) the ASUR instrument is designed to operate on board an aircraft flying near the tropopause (approximately 10 km) to avoid signal absorption of tropospheric water vapor. The pressure broadening of the detected emission lines provide an information about the altitude of the emission. That is, an emission from lower altitudes (e. g. 15 km) will result in a much broader line than an emission from higher altitudes (e. g. 35 km). Therefore the retrieval of vertical profiles of volume mixing ratio (VMR) of the measured species is possible by analyzing the shape of a detected line. The bandwidth of the spectrometer determines the lower end of the retrievable altitude range while the upper end is determined by the spectrometer's resolution. The retrieval is based on the optimal estimation method (OEM) [Rodgers, 1976, 1990]. This method allows to use a priori information to stabilize the solution. Spectra are calculated from the estimated profiles by using a standard forward model to calculate the radiative transfer. 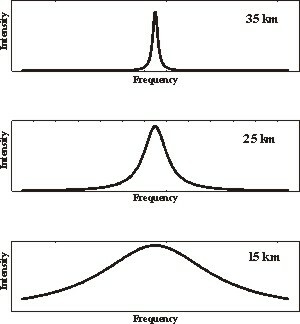 The estimated profiles are varied iterativly using an iteration scheme based on a Newton or a Levenberg-Marquart algorithm such that the calculated spectra fit the measured spectra. Temperature and pressure data for the retrieval are taken from meteorological analyses (e. g. by the Data Assimilation Office (DAO) or the European Center for Medium range Weather Forecast (ECMWF)) that are interpolated on the measurement position. The profile retrieval is performed on equidistant altitude levels of two kilometers spacing. The retrieved vertical profiles have an altitude resolution of typically 6-10 km in the lower stratosphere. Using the acousto-optical spectrometer (AOS) with a spectral bandwidth of 1.5 GHz and a spectral resolution of 1.5 MHz, profile information can typically be obtained in an altitude range between 15 and 50 km. Using the chirp-transform spectrometer (CTS) with a spectral resolution of about 300 kHz, which was implemented in 2001, the altitude range is extended to 65-70 km. Above this altitude column information is available. The horizontal resolution of ASUR measurements is determined by aircraft speed and the integration time required to achieve a sufficient signal-to-noise ratio. Typically a horizontal resolution of 20-50 km is achieved for all operational data products. 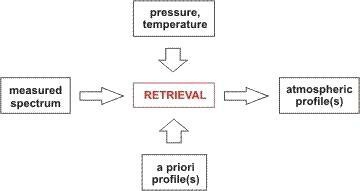 Rodgers, C. D., Retrieval of atmospheric temperature and composition from remote measurements of thermal radiation, Rev. Geophys., 14, 609-624, 1976. Rodgers, C. D., Characterization and error analysis of profiles retrieved from remote sounding measurements, J. Geophys. Res., 95, 5587-5595, 1990.